1982 JEEP Wrangler CJ5 Renegade 4X4. White exterior with yellow Renegade lettering custom painted on hood. Has a 258 4.2L OHV L6 with a 4-speed manual transmission. Restored 7 years ago. Only 23k miles since the rebuild of the L6 engine with multiple upgrades including air intake and exhaust. Lifted with 35x12.5 Dunlop RV Radial Rover Tires and 15 inch custom wheels w/ full size spare tires. Warn front and rear bumpers. KC light installed on front bumper. Brand new Kenwood marine stereo with Bluetooth and CD, front and rear speakers. Rhino lined interior. Best top neoprene seats. Custom side steps. Does have heat. Locked in rear. Only has bikini top- no doors or hard/soft top. Just serviced and NC inspected. Ready for a rainy mud pit or a nice sunny beach to cruise up and down. 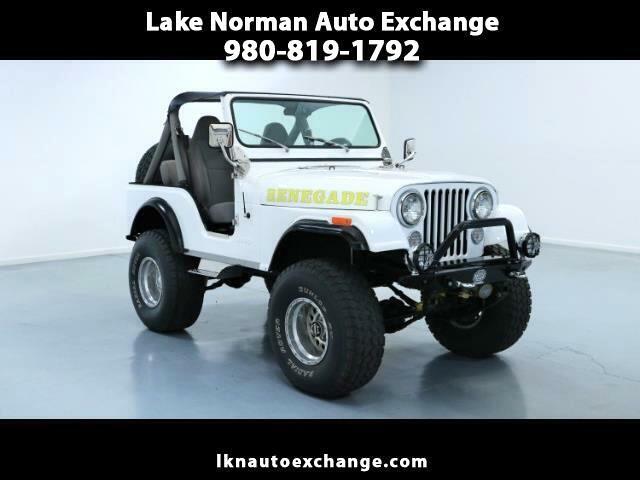 Call today to look at this beautiful classic CJ5. Call John @ 980-819-1792. Message: Thought you might be interested in this 1982 Jeep Renegade.